NCIB takes a privilege to welcome you in its world. We were established with the sole object to bring social changes and reforms in this discriminative society. Being an Indian citizen 'we the people' of NCIB family recognize our responsibilities towards society and eagerly involve in brining reformation in the society which is still ill from social maladies. We exist in the society to encounter the various problems and conflicts of the society which is pushing us back from the way of development. We are eager to provide you social security services; social education so that every citizen of the country can avail its basic fundamental rights and can fight against the hindrance which comes in the way of their success. In addition, we are as the warrior social service provider in India. NCIB is an initiative towards the creation of a society free from crime, corruption and unjust. In other words, NCIB is an institution that strives to ensure well-being of all the citizens through ensuring access to welfare schemes to the needy and ensuring rights of all its citizens without any discrimination. 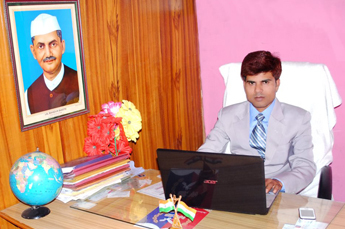 I am proud to say that our mission is successfully running under the guidance of Good Legal Adviser, Honest Government/NCIB Officers, Talented Journalist, Social Workers and all Citizen of India "who is known for his allegiance and devotion towards social responsibilities"
Thank you for visiting National Crime Investigation Bureau’s website. NCIB’s main purpose is to aware the public about their rights& duties towards Nation. It is not hidden that the system of the Indian society has been distorted. There is no feeling of patriotism or nationalism in the hearts of Indians. Have you ever thought why are there in our areas so frequent accidents on the roads, why people take drugs, why there is crime, sexual harassment, corruption, suicide, no medical facilities and such a costly education? We pay taxes to government to get facilities. But there is no importance of common men. Indian people have no courage to speak against these corrupt leaders & bureaucracy. All the NGO’s cannot provide medical and education facilities to all with a little charity. So it is the time to come forward and question the government where is our tax money being spent. NCIB invites more & more like-minded people to share their valuable views & support to make Crime/Corruption free India and RTI Act more accessible to all. We want all the NGO’s to make a collective effort and I am sure we will succeed to make RTI a common man’s tool to get information from government’s departments. You are most welcome to join NCIB and share your valuable suggestions, guidelines and information on Anti Crime Act. I am thankful to all Anti Crime workers, various organizations and supporters around the world to support and encourage me to start this initiative. Please inform about NCIB to your friends, relatives & like-minded people and join your hand with us. We want make our Country Crime and Corruption free at any Cost. So Lets Come, join and fight with us. We want make our Country Crime and Corruption free and any Cost. !! Jai Hind - Jai Bharat ! !